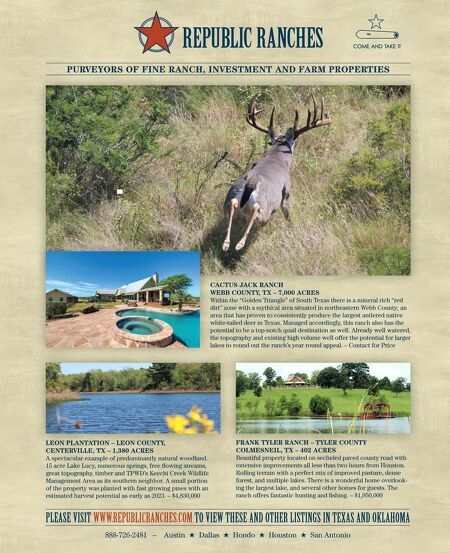 The Magazine of the American Landowner is an essential guide for investors, landowners, and those interested in buying or selling land. The award-winning quarterly is known for its annual survey of America's largest landowners, The Land Report 100. 16 The LandReport | W I N T E R 2 0 1 4 A National Roundup of Rural Real Estate News COMPILED BY STEPHEN O'KEEFE, CFA LANDREPORT.COM G REAT LAKES $17.3M Easement to Protect 67,347 Acres in Wisconsin The state's DNR has extin- guished development rights on 100 square miles of forestland straddling the Mississippi and Great Lakes watersheds. GREAT PLAINS Waurika Farms Sells at Auction for $11M Hall & Hall Auctions sold the Drummond family's Oklahoma cattle opera- tion for $1,833 per acre, well above pre-sale estimates. SOUTH American Forest Management Buys International Forestry Consultants AFM currently manages 4.5M acres of privately owned timberland. The ac- quisition launches it into the Pacific Northwest. W EST Sporting Ranch Capital Management Debuts Jay Ellis will topline the Dallas-based private equity fund, which focuses on undervalued ranch properties across the Rocky Mountain West. SOUTHWEST Arizona Governor Vetoes Legislation Seeking Federal Lands The bill demanded Uncle Sam turn over title to 48,000 square miles of public lands. Jan Brewer respectfully declined. MIDWEST Farmland Values Continue to Climb in Seventh District The Chicago Fed reports that farmland values in this key agricultural belt continued their climb in 1Q. Complete details on pages 24-25. PACIFIC George Lucas Shelves Movie Studio Plans for Grady Ranch Despite great effort, the Marin County landowner failed to sway opponents of his studio. He saw more jobs. They saw more traffic. Everyone loses. N ORTHEAST Nantucket's Swain's Neck on Market for $59M The 1997 sale of the 68-acre estate to Russell Phelon set a New England record. Gary Winn at Maury People Sotheby's has the listing. 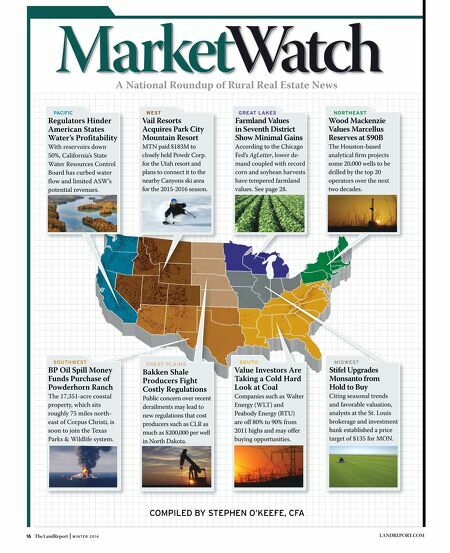 A National Roundup of Rural Real Estate News COMPILED BY STEPHEN O'KEEFE, CFA GREAT LAKES Farmland Values in Seventh District Show Minimal Gains According to the Chicago F ed's AgLetter, lower de- mand coupled with record corn and soybean harvests have tempered farmland values. See page 28. GREAT PLAINS Bakken Shale Producers Fight Costly Regulations Public concern over recent derailments may lead to new regulations that cost producers such as CLR as much as $200,000 per well in North Dakota. SOUTH Value Investors Are Taking a Cold Hard Look at Coal Companies such as Walter Energy (WLT) and Peabody Energy (BTU) are off 80% to 90% from 2011 highs and may offer buying opportunities. WEST Vail Resorts Acquires Park City Mountain Resort MTN paid $183M to c losely held Powdr Corp. for the Utah resort and plans to connect it to the nearby Canyons ski area for the 2015-2016 season. SOUTHWEST BP Oil Spill Money Funds Purchase of Powderhorn Ranch The 17,351-acre coastal property, which sits roughly 75 miles north- east of Corpus Christi, is soon to join the Texas Parks & Wildlife system. MIDWEST Stifel Upgrades Monsanto from Hold to Buy Citing seasonal trends and favorable valuation, analysts at the St. Louis brokerage and investment bank established a price target of $135 for MON. PACIFIC Regulators Hinder American States Water's Profitability With reservoirs down 50%, California's State Water Resources Control Board has curbed water flow and limited ASW's potential revenues. NORTHEAST Wood Mackenzie Values Marcellus Reserves at $90B The Houston-based a nalytical firm projects some 20,000 wells to be drilled by the top 20 operators over the next two decades.